MemberDirect Business is a flexible, and powerful business banking tool used by businesses small, medium and large. This multi-faceted financial management tool was being used by a variety of end users to perform a multitude of functions. All this flexibility and power came at a cost: the resultant complexity of the tool risked making it unwieldy for users when performing certain tasks. We really needed to step back and carefully observe the types of problems users were expecting it to solve. What areas needed to be streamlined? What features needed to be shaped a bit more? Was there one approach to a function that would suit all users? A deeper understanding was in order so that we could better focus the user experience. To start, I interviewed many users to help create stronger user personas. Narratives built around these personas were used to make the case for further, deeper investigation. I conducted an extensive heuristic evaluation of the product, streamlining various areas to better align in with best practices in the industry. 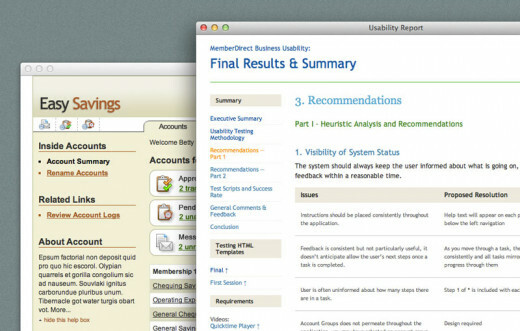 The team created iterative prototypes which were used in a series of usability tests with end users. These first hand observation helped us to refine workflows in fresh and surprising ways. To capture the findings I created a detailed report, including prototypes, for the product development and product management teams. This helped them to set the product's roadmap. This deep period of discovery would inform interaction design across the entire product line for years.